Known as one of the more popular varieties of the beryl family, aquamarine stone comes with a lot of history and beliefs. Historically, it has been known to be quite a fabled stone. If you break down the word, it is divided into two different Latin words – “aqua” for water and “marine” for the life in the sea. Therefore, aquamarine can be translated into a stone that holds the power of water and the sea as well. It is believed that it gets its name because of the rich and vibrant blue hues it comes available in. Other reason might be because in the ancient times, it was believed that it gave sailors protection on their voyage. Aquamarine comes with high grade in crystalline clarity and quaint, calm blue colours, sometimes found with a hint of green, too. It is predominantly found in Brazil, which remains the main source of mines. Other places where one can find aquamarine are China, India, Burma, Pakistan, Nigeria, Zimbabwe, and some others, too. Much recently, India has also explored mines abundant with aquamarine gem. Aquamarine, in its rawest form, is extracted in the form of crystalline slabs. These slabs or boulders are individually cut out, maintaining the size for a better cut. Then forth, the cuts are made, followed by the process of polishing. Bush hammering and flaming take care of the colour and clarity of the final-cut stone. However, there remains another way, which is referred to as simple finishing. It involves the cutting and processing of the extracted slab with the use of natural surfaces. That said, both the processes end with commercially-fit gemstones. Unlike most other gemstones in crystal forms, the quality of aquamarine is judged by its one single hue and the intensity of its tone, and not the mix of multiple. The worth of the gem can go up and down, depending on how rich and intense the single colour is. Following to this, your gemstone will be more valuable if it has darker shades of blue-greens. If your specimen has a richer, deeper, and engaging shade of blue or green, it is bound to be costlier and of higher worth. However, if it has grey shades and white-ish appearances with a washed-out colour, it’ll be on the lower range of price. Just like all the other crystals, the clarity of this stone is of pivotal importance. It is one of the biggest determining factors of its value. The perfect and near-perfect quality of aquamarine will have no visible inclusions. It’ll be absolutely and stark clear to the naked eye. Even if your aquamarine specimen lacks any colour but has bespoke clarity, it’ll look like a coveted ice slab when worn, making it a stunning sight. A cut of the stone makes a lot of difference in its quality. That said, it matters a lot as to what cut of aquamarine you have opted for. Traditionally, it sports popular and loved shapes like emerald cut, octagon cut, princess cut, oval cut, and more. However, if you find rarer shapes like heart cut or trillion cuts, it means that your stone has a higher value. These designer cuts by lapidaries seem to enhance the colour and clarity of the stone in the most beautiful way. With higher count of faceting goes up its sparkling factor, too. 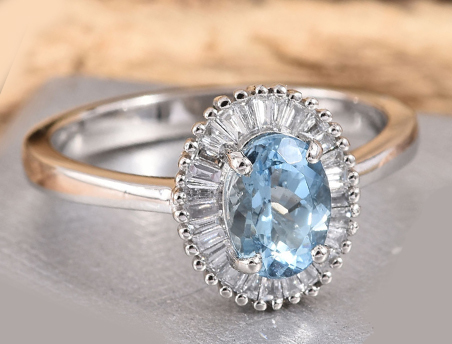 Unlike most other gemstones, the value of an aquamarine does not increase with its carat weight. The said gem is available in a whole spectrum of weight. Starting from lower than a carat to as much as 10,000 carats. You’ll find the colour-clarity you want if you seek the stone that’s above 5 carats. The value of aquamarine fluctuates till it’s under 25 carats. When the weight goes beyond that, it gets difficult to fit the stone in a jewellery design, so its value plummets again. No artificial treatment of any sort goes into the process of making aquamarine. The stone is one hundred percent natural. However, a brief heat treatment is exposed so the inclusions can be eliminated. Other benefits of this heat treatment are enhanced colour and spotless clarity, all of which seem to make it more valuable. It also needs to be said that this heat treatment, in no way, affects the quality of the stone. It doesn’t damage the gem, nor does it compromise the stability of its composition. Nothing speaks the regal flair and charm quite like the blue tones. Blue and white make for the ideal colour combination as they have this tinge of all things royal embellished in them. This is the main reason why you’ll see several diamond-and-aquamarine pieces of jewellery. Laid in the remarkably posh tones of yellow gold, pristine shine of white gold, or darling joys of rose gold, the stone comes out singularly as a charmer! Find countless jewellery designs boasting this fine and gorgeous combination that’s fit for all the royal styles. Another brilliant combination we can’t stop raving about brings you the different shades of blue. Yes, we’re talking about the beautiful and loving combination of aquamarine and sapphire. The two intensely rich hued gemstones look absolutely bespoke together. You’ll find some breath-taking pieces that put these two marvels together, offering you an unparalleled taste in glitter and joy. This combination is widely popular in aquamarine rings and aquamarine necklaces. When it comes to the prowess of metaphysical healing from aquamarine, it is considered a powerful and positive crystal. There are lots of healing benefits and legends attached with the said gem, making stand amongst high regard. It is a gem full of energy and spells in the healing community. Below are some of the major benefits of decorating or wearing aquamarine in any which way you like. Known as the stone of courage and protection, aquamarine looks beautiful as a décor piece. Not only in its crystalline form, it also looks marvellous in the cabochon or beaded form. In the healers’ community, the stone holds a lot of power that might affect your living in a robust and positive way. It is believed that if you place an aquamarine crystal in the room, it helps in cleansing the negative aura. It brings much-needed positivity to your living space and eliminates depression, self-doubt, anxiety, and more. Another common use of the stone is for students. It is believed that aquamarine gem can be extremely helpful for students, or any person that might be studying. It is said that the stone aids intellectuality and processing of knowledge. You might also put the crystal or ball in your study room, as it helps you grow spontaneous problem-solving, too. The known and popular birthstone is considered to be quite powerful when worn. It is a gem that affects your throat chakra, healers claim. This helps in making your verbal communication better and more fluent, providing you with more confidence and clear other communication blocks. Aquamarine has other known benefits, too. In the ancient times, it was believed to bring luck and strength to the voyagers. And so, they wore the stone on them on their journeys. It is believed to control the powers of water and grant you safe travels without drowning. In fact, some people regard it as an extremely helpful stone for the people with fears or phobias. When it comes to physical benefits, Aquamarine is known to be helpful. Healers across the globe claim that stone, when worn, is extremely helpful for the people who’re suffering from thyroid problems or pituitary issues. It also proves to be helpful with autoimmunity diseases. Wearing aquamarine gem can help you with sicknesses in the throat. Aquamarine is a lovely, beautiful stone that you wish to flaunt in the best of its ways. It is also found at affordable costs, across the globe. However, there are instances where you don’t wish to wear it, for any reasons. To help you with that, we’re presenting a list of gemstones that have the same colour, clarity, or value as of aquamarine stone. In cabochon, crystal, or beaded form, these beauties will lend you just the exquisiteness of aquamarine itself. If you’re looking for a gem that’s in the aquamarine colour but not in a crystalline form, then this is the best option for you. Amazonite has hues that are very much similar to those of aquamarine. But this stone comes in cabochon, beaded, or solid-coloured form, instead of crystals. Enriched with hints of green in the base tone of pale blue, it a wonderful choice, indeed! Another gemstone with hues similar to raw aquamarine rock, larimar comes in non-crystalline form, too. However, there is one noticeable different in both the gemstones – Larimar can be seen with streaks and clouding of white over the pale blue base, making it resemble strongly to open summer skies. Both aquamarine and larimar are on the same grade of prices. Known for its beautiful colours, turquoise is another gemstone featuring tones that are very much similar to those of an aquamarine. However, it is found in cabochon and polished form and not in crystalline quality. You can find different shades of intensity of this stone and wear it in perfect designs. Another category that we present brings you gemstones that look every much like aquamarine crystal. With striking clarity and peaceful blue colour, these gems are sure to make it look like you’re wearing just the stone. Apatite is one of the limited number of gemstones that resembles the colour and aesthetics of a real aquamarine. With shades of blue that are a little darker, it can act as the perfect substitute if you aren’t looking for aquamarine gemstone. The stones also happen to fall in the somewhat a similar price grade, making it a nice and suitable substitute. Available in a whole spectrum of different colours, topaz is a crystal that is known by many. Its variety called the blue topaz brings you aesthetics that are closer than most to aquamarine. Find several cuts, facets, and sparkling delights of it, embedded in stunning jewellery designs. What to Remember While Buying Aquamarine? 1. The first and the most important thing to remember while getting the best aquamarine stone value is its colour. The said gemstone flaunts a light, open-sky blue colour, in both crystal and beaded form. Sometimes your aquamarine colour might have hints of green in it, too. 2. If you’re looking at a top-quality aquamarine rock, then it won’t have any visible inclusions. The crystal should be clean to the naked eye, with the absence of any obstructions. The milky aquamarines are lesser expensive than clear ones. 3. Finding a big-sized aquamarine is rare, which also makes it expensive. So, next time if you’re looking at a beautiful aquamarine ring, remember that it will be expensive, too. If the dealer is giving it to you at a bargain price, it is too good to be true. 4. One of the most popular cheap substitutes of aquamarine gemstone is topaz. While both their colours are somewhat same, they have a noteworthy different in value and composition. You must look out for the same and know the differences. 5. Aquamarine stone prices increase if the gem holds one colour, be it green or blue. This is the reason why aquamarine with only blue in it is considered to be more expensive than the one with slight hints of green, too. 6. Know that aquamarine ranks 7.5-8 on the Mohs Scale of Hardness, which makes sure that it doesn’t chip off that easily. That said, it can still abrade if rubbed against hard surfaces. Cheaper copies of the stone rank lower in hardness and easy to break. Aquamarine birthstone is believed to be truly beneficial for the people who have been born in the month of March. When fashioned, it is supposed to bring them luck, joy, and happiness in life. Aquamarine stone prices rely on the four main distinguishable features. They are – colour, cut, carat, and clarity. They all together define the value and price of the gemstone. Aquamarine ranks 7.5-8 on the Mohs Scale of Hardness, which makes it difficult to break easily. However, that said, it is still susceptible to damage if abraded against harder surfaces. The said stone undergoes a brief heat treatment, which is done to enhance its colour and clarity. But the treatment, in no way, affects the stability of its construct. Aquamarine gem belongs to the same beryl family of emerald and sapphire. The stone is considered to be an ideal present for the 19th wedding anniversary, too. Is Aquamarine more expensive than diamonds? Diamonds have been considered among the costliest stones. Aquamarine rocks are rare, yes, but they’re not usually as highly priced as diamonds. However, that said, it all depends on the cut, clarity, carat, and colour of the gem to determine its true worth. Your aquamarine stone price could be high or low, depending on these 4 major factors. What is the best colour for an aquamarine stone? Aquamarine colour can be noticed in different shades and tones. While the most popular and famed of them all is pale blue with crystal clarity, there are other green-tinged tones, too, that can be found. The stone that undergoes heat treatment may also even get darker shades of blue. Aquamarine is not a rare stone. It is, in fact, found at a lot of places all across the globe. An abundant location has been discovered recently in India. However, if we’re to talk about the colours of aquamarine, then the darker-hued stones are a rare sight, indeed. Most of these crystals found are in pastel blue colours, so the stones with a deeper tone of blue are considered rare and prized. What colour of Aquamarine stone is the most valuable? As mentioned above, aquamarine is mostly found in different intensities of the colour blue. While lighter tones of the hue are more commonly found in the stone, darker blue aquamarines are considered to be rare than most, making this variety more valuable. Do Aquamarine stones scratch easily? Aquamarine gemstone ranks 7.5-8 on the Mohs Scale of Hardness. It means that the gem itself is made of durable and sustainable composition and cannot shatter easily. But still, it is quite possible it gets abraded or scratched on the external surface if rubbed against a rougher surface. How can you tell the quality of an Aquamarine? Well, as we have mentioned above, there are four main factors that decide the quality of the stone. They are cuts, clarity, carats, and colour. If you’re looking for that perfect aquamarine stone, then it’ll have a multiple faceted cut, stark clear composition, pale blue to dark blue colour, and it’ll weigh above 5 carats. The gemstones below 5 carats are usually lower prices and so are the ones above 25 carats. Can Aquamarine lose its colour? It’s true that heat treatment has no effect on the stability of the stone. It even enhances the colour by good grade. But if you keep aquamarine in the Sun for a prolonged period, it may tend to fade out over time. It is why you should take good care of it and stow it away from long exposure in the sunlight. How to take care of an Aquamarine? Taking care of an aquamarine stone is very simple. If you wish to clean it, all you need is warm water, soap, and a soft cloth. Put your stone of jewellery in slightly warm water that has been added with a few drops of mild detergent. Gently rub the dirt and grime off your stone and rinse it under water again. Rub away excess moisture using a soft cloth and let it dry properly before wearing. Yes, aquamarine is the birthstone of the month of March. It means that everyone born in the month can benefit from wearing it, or so the astrologers claim. It is also the ideal stone for all the people who belong to the sign Pisces. You may also present it as a present for the 19th wedding anniversary. Much like many other crystals, aquamarine is considered to be a powerful and effective stone that induces positive energy. It is also known to calm the fears and phobias of the wearer and provide a sense of security to them. Other believed benefits of wearing the stone are in regard with the throat chakra, which means that if you wear aquamarine necklace, you’ll get more verbal confidence.